Tonight’s boxing action in Monte Carlo has seen some famous faces at ringside including Tyson Fury and Roy Jones. 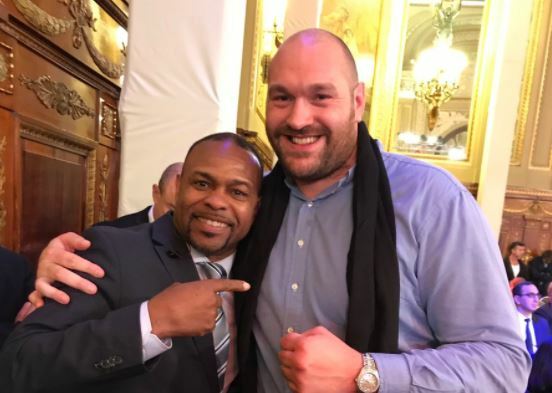 Tyson Fury and Roy Jones, heavyweights from different eras – have come across one another’s paths tonight as Jones works for HBO as a commentator and Fury is at the same event in Monaco watching the fights as a fan. Fury would have been watching heavyweight Dereck Chisora’s fight closely earlier. A bout Chisora lost by majority points decision. That potential comeback fight as a warm up for Fury is now gone. But it’s not all bad news for Fury tonight who got to meet one of his boxing idols at ringside. A boxing picture to remember there. Fury has been meeting a number of fans over the last couple of days in Monaco taking pictures everywhere he can, as many fans continue to call for his comeback. The comeback was confirmed by Fury earlier this week for 2018 and now the main challenges seem to be getting back in fight shape – as well as getting his UKAD hearing out of the way. One suspects getting his boxing license back will be relatively straight forward provided he does the above two. Next Post: Watch: Dmitry Bivol Lands One Of The Biggest Punches Of 2017!